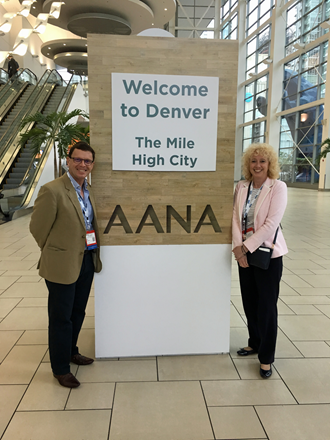 Peter Brownson and Chris Walker have just returned from the Arthroscopy Association of North America (AANA) meeting in Denver USA. 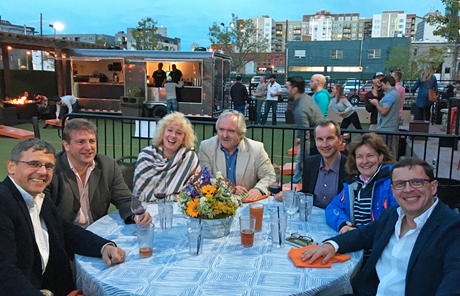 They were part of a delegation of UK Orthopaedic surgeons invited to put forward a British perspective and provide a counterpoint to the North American view. The delegation was led by British Orthopaedic Association President, Mr Ian Winson, and comprised a group of key opinion leaders from the UK covering all orthopaedic subspecialties. Mr Brownson was joined by his colleagues from the Bone and Joint Centre, Mrs Jo Gibson (Specialist Physiotherapist – BESS) and Mr Chris Walker (British Orthopaedic Foot and Ankle Society – BOFAS). Other members of the delegation included Mr. Duncan Tennent (British Elbow and Shoulder Society – BESS), Mr. Bill Harries (President BOFAS), Mr. Andy Williams (British Association for Surgery of the Knee – BASK), Mr. Sanjeev Anand (BASK), Mr. Simon Roberts (President British Orthopaedic Sports Trauma Association – BOSTA), Mr. Sam Oussedik (BOSTA) and Mr. Matt Ravenscroft (BESS). The meeting proved to be highly successful. There were over 1000 attendees and the convention took place in an atmosphere where all participants felt fully engaged and which, at the same time, conveyed a friendly, relaxed atmosphere that engendered excellent discussion. There was a second morning session, focusing on shoulder surgery relating to the management of massive rotator cuff tears, including a discussion on superior capsular reconstruction (SCR), a relatively new technique which is currently being evaluated by Mr Brownson for the management of large or massive irreparable rotator cuff tears in individuals without significant arthritis. There was a subsequent symposium, during which Mr Matt Ravenscroft (UK) presented his experience of the In Space balloon, a novel device being evaluated in the UK for similar indications as the SCR. The Friday programme included a scientific session focussing on the management of bicep tendon problems. 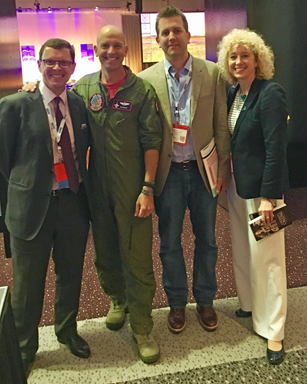 It was followed at lunchtime by the Presidential Guest Speaker, Major Dan Rooney. Major Rooney gave a tremendous presentation highlighting his life’s work. He is a remarkable individual who is a fighter pilot with three combat tours in Iraq, a PGA Golf professional and the founder of the Folds of Honour, a charity based in the USA which provides educational funding for the families of bereaved servicemen. He has served as the motivational speaker for two US Rider Cup teams and is a Fox news contributor and has may other accolades to his name. His inspirational talk emphasised the importance of ‘volition’ and the need to believe in one’s ability to effect change. After the presentation, he kindly met some of the delegates including the visiting members from BESS. The Friday afternoon session included a symposium on shoulder rehabilitation. During this session, Jo Gibson gave a presentation on ‘Rehabilitation Tips from the United Kingdom’, focusing on her huge experience of the rehabilitation of elite athletes after shoulder trauma. On Friday evening, Dr Richmond invited the UK delegation to a private dinner. At the dinner he thanked the UK delegation for attending and contributing to the meeting. 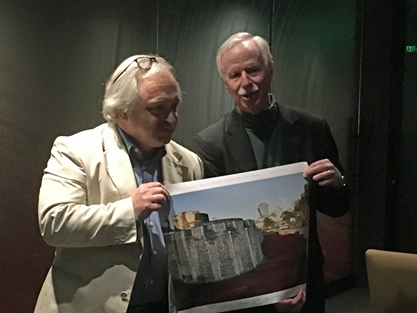 His kind invitation was acknowledged by Ian Winson (President BOA) who presented Dr Richmond with a signed picture from the British delegates. The Saturday session started with a set of instructional course lectures. During this session, Mr Brownson gave a presentation on the “Management of Posterior Shoulder Instability”. Later that morning, he and Jo Gibson gave the feature lecture of the day on the ‘Management of Instability in Elite Athletes’. This was a 25 minute joint presentation, during which Mr Brownson and Mrs Gibson explained their philosophy for the management of shoulder instability as a whole, as well as explaining their philosophy for patient rehabilitation and assessment for return to play in elite athletes. The presentation appeared to be very well received as it particularly emphasised the close working relationship between surgeon and physiotherapist, and the advantages this has for the patient. Such a close working relationship is unusual in the US due to different patterns of working but is an approach very much promoted by the British Elbow and Shoulder Society. The Friday session was completed by Mr Brownson taking part in an expert panel discussion on ‘The Management of SLAP injuries’. 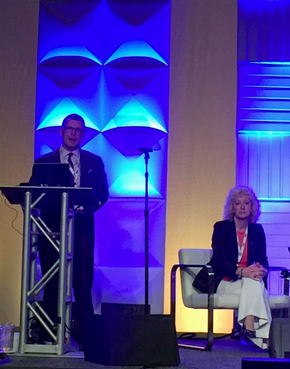 He was joined on the panel by Mr Mat Provencher, Shoulder Surgeon at the Steadman Hawkins clinic in Vail, Mr Steven Snyder, Consultant Surgeon (and the surgeon who defined the term ‘SLAP lesion’) and Mr Matt Ravenscroft (UK). Mr Walker, one of three UK foot and ankle Surgeons represented at the AANA meeting, found the opportunity to meet and talk with other arthroscopic surgeons was excellent. 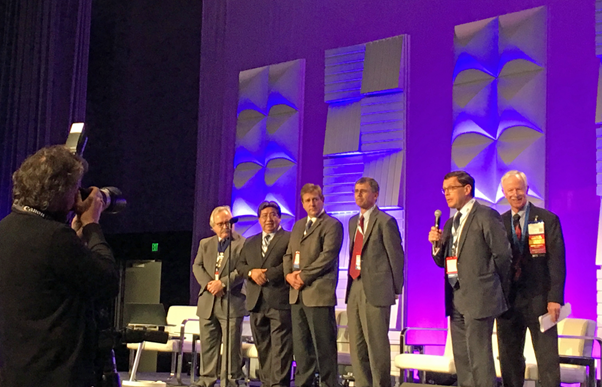 He took part in a Clinical Case Panel with three US Surgeons discussing a number of complex cases. There was a lot of agreement between them on management principles although some indications for surgery did vary. He was encouraged about the advances in arthroscopic surgery in both countries but also that other US foot and ankle surgeons could see the advantages for patients in focusing their expertise based around the foot and ankle rather than based on using arthroscopy for a number of different joints. Altogether both Mr Brownson and Mr Walker, found it informative, enjoyable, and worthwhile and hope to be able to attend again in the future. Simon Roberts, Bill Harries, Jo Gibson, Ian Winson, Terry Byca (Arthrex UK),Georgina Brownson PB (left to right).